Thanks Willy. I'll have a look at your suggestions. We might be able to do something as part of the chnages we are making at the moment. Sure Garmin navigation by tcx (fit) is popular but new development is not announced by Garmin. My suggestion: Add compact direction information into the (always English) <sym> (Similar to the tcx system). In link see the attached gpx navigation waypoints by informative <sym> as used by Android Locus app. Contains not only basic Left Right Straight but has extra instructions as set by the <sym> text. A rarity in free gpx development but would be appreciated there is some uniformity in used <sym>. We are planning to add some new features to enhance the routes directions in the next update to the route planner, including the ability to change turn arrows. A picture update by actual new Android Locus map development. Feature ID61: +/- as in the picture ? Creating short commands in tcx <Name> or gpx <name> In tcx <Name> 10 character limit by the Garmin tcx standard ! 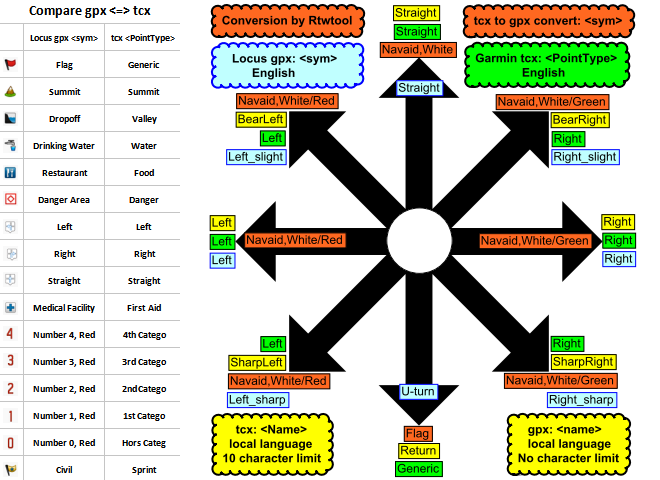 In tcx <Pointtype> out of 16 types, has 3 directions types, Left/Right/Straight. As there exist "no gpx navigation standard system" suggest to use a most similar gpx <sym> by the typical standard Garmin gpx symbol range. Same as by the "JavawaRTWtool" converting the tcx coursepoints into gpx waypoints. Navigation (tcx). Four lines of instructions ? So no info from the 10 characters limited tcx <Name> but displayed info from the tcx <Notes> attribute. Thanks for taking the time to put forward these suggestions Andreas, much appreciated. I#ve added them to our Feature Requests list where people can vote for them (numbers 59, 60 and 61). I really like your route-plotting tool, it certainly rivals RWGPS in mary areas. I've used plotaroute to plan a few road cycling routes, and often find myself editing the cue sheets. Therefore I have a few suggestions to your cue sheet customization, with the first one carrying the highest priority. Sometimes the automatic suggestions in the cue sheet provide no turn icon or an arrow that's not fitting for the turn coming up. RWGPS provides the opportunity to customize this, which helps a lot with precise route planning. This could be done with a clickable circle of arrows inside the "add/edit directions or notes" box. Something like this. The middle could be blank to offer an "iconless" note. Different note detail levels would be very useful. I dont have time to read four lines of instructions on a tiny screen while going 40 km/h on my bike. I need to keep my eyes on the road. I prefer my directions as simple as possible, which is why I spend a lot of time customizing cue sheets. An example from my neighborhood is "At the roundabout, take the 1st exit onto Biskop Jens Nilssøns gate" accompanied by a right arrow. In this situation a simple "Turn right (1st exit)" would suffice. The first word tells me there's a turn coming up, the second word tells me the direction and the paretheses signals a roundabout (because these are the only ones with multiple exits). At the minimum the user should have the option to disable street names and numbers. It would be great if the text and turn symbols were directly editable in the cue sheet, without having to open the edit box (you could use a dropdown from the symbol field to change directional symbol here). Being automatically scrolled to the top of the sheet interrupts the workflow when customizing multiple notes, as you loose where you are in the sheet. Simple changes to arrows and text should be accessible right there, without automatic expansion of a larger edit-box. The straight forward arrow seems to be missing from the suggestions. This could be used with the "continue"-note, or at the users discression.